Home / Latest TBV News / Thanks little sis! Victorian stallion gets a Golden update! Thanks little sis! Victorian stallion gets a Golden update! John Pratt of the West Gippsland based Brooker Park rode home Estijaab to victory in the Golden Slipper at Rosehill on Saturday. And it wasn’t because he had a big multi hanging off the win! It was due to the farm’s blue-blooded stallion De Gaulle being a half-brother to the Slipper victor. While the emotions were flowing from the Hawkes stable post victory, John was soaking it all up at Mornington on its Cup Day. “This will be just brilliant for him as a stallion, and really give him a boost to becoming a commercially recognised stallion prospect. He is an amazingly well-related stallion now!” Pratt said. Brooker Park built up an exciting broodmare band to go to De Gaulle in his first season last year with mares by influential sires such as Sadler’s Wells, Volksraad and Carnegie. “My business partner, Richard Anderson from Quilly Park, and I have been purchasing quality broodmares, selected by Diane Neylon, to suit De Gaulle’s pedigree, and I’m sure there will be some good ones in his first crop,” Pratt said. Highly rated as a juvenile and spoken of as the next potential superstar, De Gaulle was touted a genuine Golden Slipper runner, winning his first trial on pure raw ability. Trained by Snowden Racing, as a two-year-old De Gaulle trialed, and franked his form by beating Diamond Tathagata, the future Group 2 Skyline stakes winner and Blue Diamond runner up Pariah. Unfortunately, a tendon injury cruelly caused his racing career to be cut short without running a race. Being out of the dual Group 1 winning mare Response, Estijaab was consigned by Arrowfield Stud to the 2017 Inglis Australia Easter Yearling Sale where she was purchased by Emirates Park / B Carlson for $1.7 million, which makes her the second most expensive yearling filly by her sire, while De Gaulle’s half-sister is the stakes placed three-year-old Fastnet Rock filly Alter Call, who sold for $1.05 million. After beating off the favourites Written By and Sunlight, Estijaab bravely held the finishing burst by Tony McEvoy’s second-stringer Oohood (I Am Invincible) by a long-head with Sunlight (Zoustar) holding out Written By (Written Tycoon) for third. 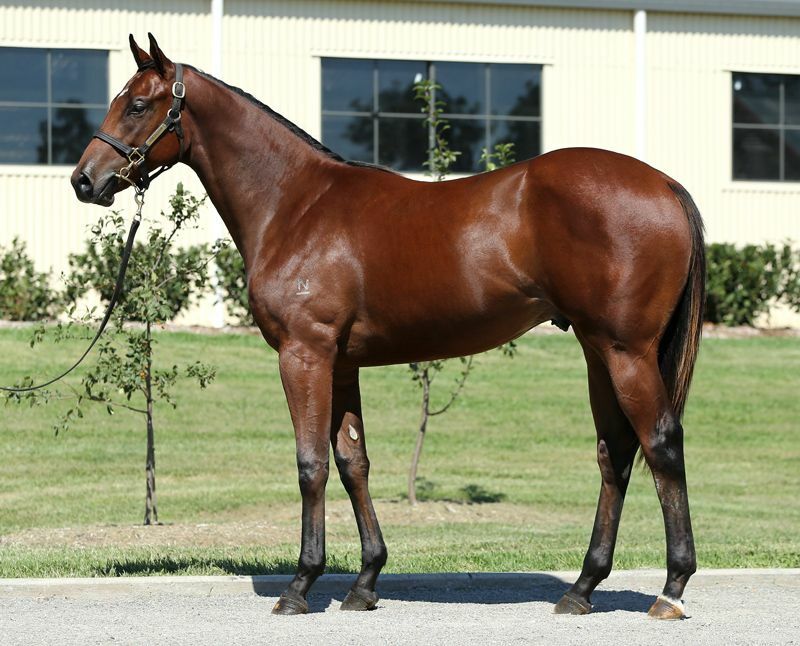 At the 2018 Magic Million Yearling Sale, Arrowfield Stud consigned a Snitzel filly out of Response who was purchased by Moody Racing for $350,000. No doubt that purchase looks like a bargain now and Moods will be rubbing his hands together in glee. “My partner, Richard Anderson tried to buy a share straight from Moody after Estijaab won her first start, but she had already significantly gone up in price. Who knows what she would be valued at now,” Pratt said. With the VOBIS Sires $1 million two-year-old sprint for nominated progeny of Victorian sires, De Gaulle will provide a brilliant opportunity for mare owners to visit a stallion that is an exciting and affordable option in Victoria for the ‘breed to race’ breeder. “Being a son of Exceed and Excel, out of the great mare, Response, De Gaulle can offer proven speed to the VOBIS Sires race,” Pratt said. Based in lush, rich dairy country, Brooker Park offers a walk on service to visiting mares for their two stallions, Danesis (Danehill) and De Gaulle. De Gaulle will stand for a service fee of $5,500 incl GST this season. Contact John Pratt on 0427 275 555 for more information. EARLIER POST: Here comes the Sun!